We Clue You In about NLM Tours…and Invite You to Join Us! 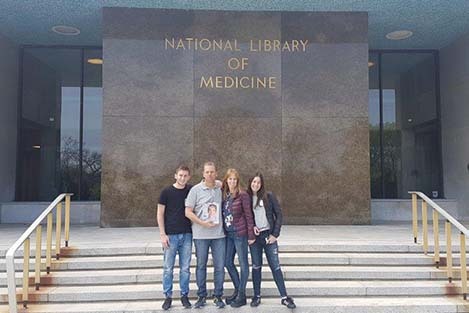 > A family from Argentina at the main entrance of the Library. The pediatrician dad, holding a copy of NIH MedlinePlus magazine, wanted to visit the home of PubMed, the database in which his published article resides. 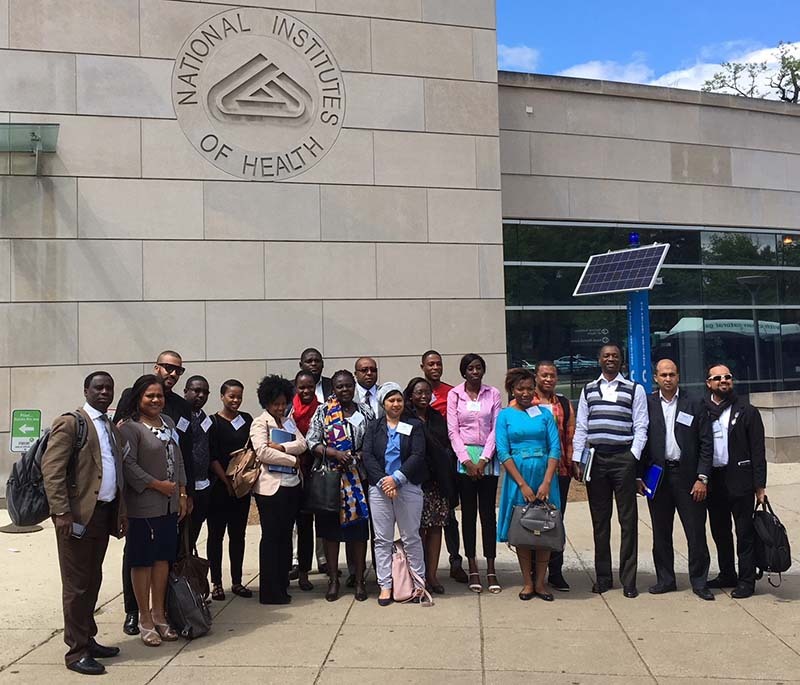 > Physicians from 16 countries at the main entrance to the National Institutes of Health campus. 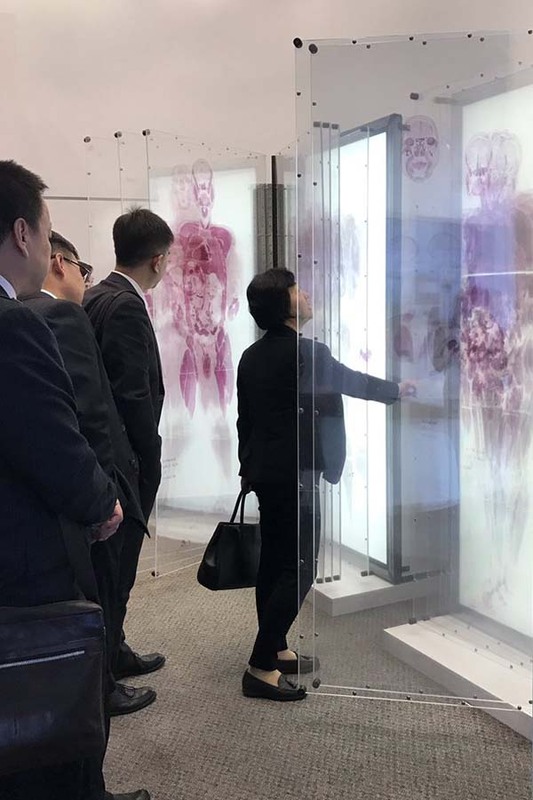 Part of a State Department-sponsored program, several said that visiting NIH and NLM was something they had dreamed about for years. 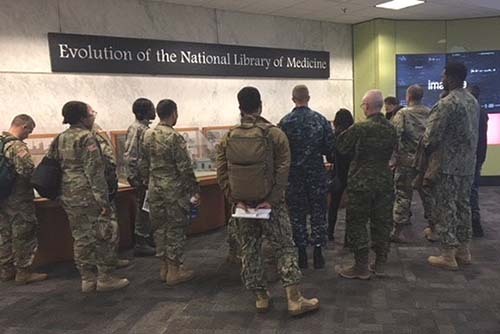 < Tara Mowery, chief of NLM Visitor Operations, describing models of the Library’s past and present homes to visitors from the Uniformed Services University of the Health Sciences, Bethesda, Maryland. 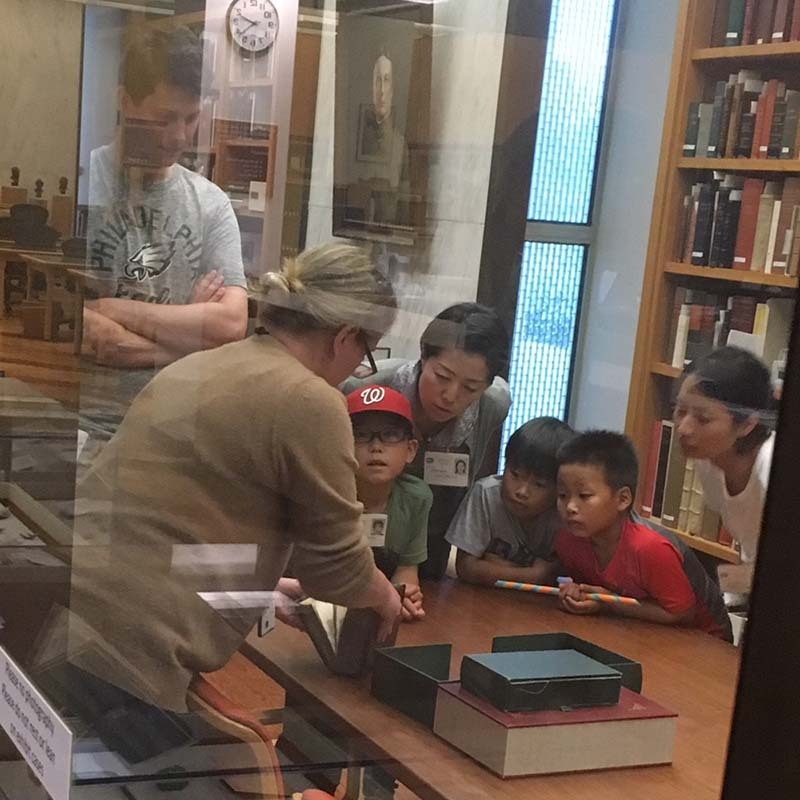 > Krista Stracka, rare book cataloger in the History of Medicine Division, in HMD’s Incunabula Room, mesmerizes different generations with rare and ancient treasures. 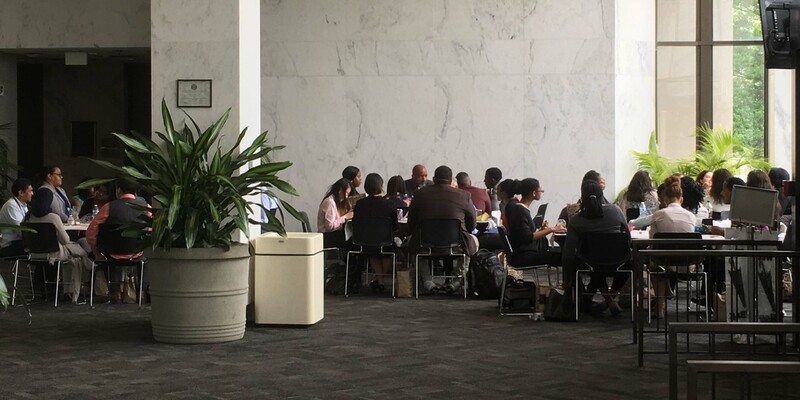 < Howard University students in the Lister Hill Center lobby, lunching and learning with NLM staff before their tour. v National Center for Biotechnology Information scientists Roxanne Yamashita and David Hurwitz in the Visitor Center with high school students from Allegany County, Maryland, discuss careers in science. 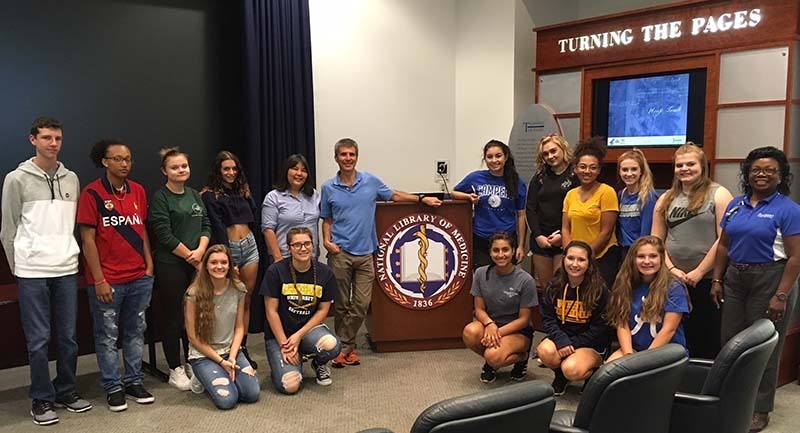 Welcome to the world of National Library of Medicine tours, where visitors come from every state in the US and from around the world. In fiscal year 2017, visitors representing 82 countries, from Afghanistan to Zimbabwe, came to tour NLM. More than 3,100 people toured the Library last year and, with our new chief of NLM Visitor Operations, Tara Mowery, who started in July 2016 after being branch chief of the NIH Visitor Center, the number of guests continues to increase. What do they come to see? 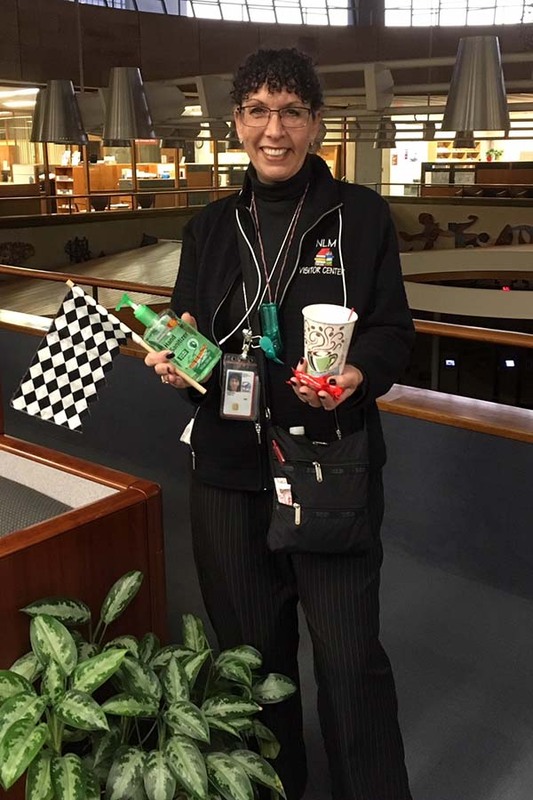 Tara Mowery knows a good tour guide must be prepared for anything. Learning about the Visible Human Project through the life-sized artworks and a haunting hologram. Hearing about the construction of the Library and why we have three floors of underground stacks. (Spoiler alert: It involves the Cold War.) Upon request, you can also tour those stacks, which are closed to the public. Seeing the Computer Room that’s in full operation 24/7 (even in the face of a Snowmageddon or a government shutdown) to ensure that customers around the world have access to NLM databases. Seeing some of the oldest and rarest medical books in the world in the History of Medicine Division. Visiting the main Reading Room and realizing that, with a library card, they can have access to any of the items in the collection here on site. This sounds kind of cool. Can I go on an NLM tour, too? Tours are available Monday through Friday (except federal holidays) at 1:30 pm and walk-ins are welcome. The basic tour lasts about an hour. December 6, 2017 in Programs & Services. I like it, this site is very interesting. I always enjoyed giving the tours when I did them years ago. Favorite part was telling about the bomb-shelter aspect of the building and how all the books and important people (like us in the Index Section) would survive but those unimportant people up in the mezzanine like the director, wouldn’t. Seeing and learning about NLM was the most unexpectedly AWESOME part of my time at NIH. I never understood how much invaluable information is housed at NLM. Perhaps more importantly, I had no idea that there were so many historical relics there, too. I probably would’ve gone my whole life without seeing a Nobel prize or a 1st edition copy of On the Origin of Species if it weren’t for the tour. It was a real treat to see all those works. Being so close to so many pieces of history put me in awe of the scientific community. It’s a humbling thing to walk around the table and go from anatomically incorrect diagrams to the codons of DNA. Thank you for providing that dose of magic to my otherwise ordinary week.